Anyone Here Wear The Sack In 1958? In my city at least, it was popular during the summer '58, and then disappeared. I remember 'shifts' from the 60's mostly...as my mom wore them from time to time. I was born in 57, so I don't have specific memory before early childhood.) But I have a fondness for 50's fashions, so I remember seeing pictures and pattern covers of these types of dresses. I was about ten years old when my mother's bridge club gave her a sack dress for her birthday. It was coral color and full in the back. The hem was quite narrow. I remember she bought matching earrings and wore it. She also splurged and bought her first bottle of designer perfume to wear with it. Shalimar. I think Dad and I giggled about it and that kind of inhibited her from wearing it as she didn't wear it for very long. It was quite a bold change for the conventional fifties defined waist. I remember thinking the shape of the dress was so unflattering that these men who were designing clothing for women must have been secretly having a laugh at their expense. What I see in this video is downright ugly - American interpretation of the "sack dress" may be? It looks more like... what's the name - "moo-moo dresses" if anything. 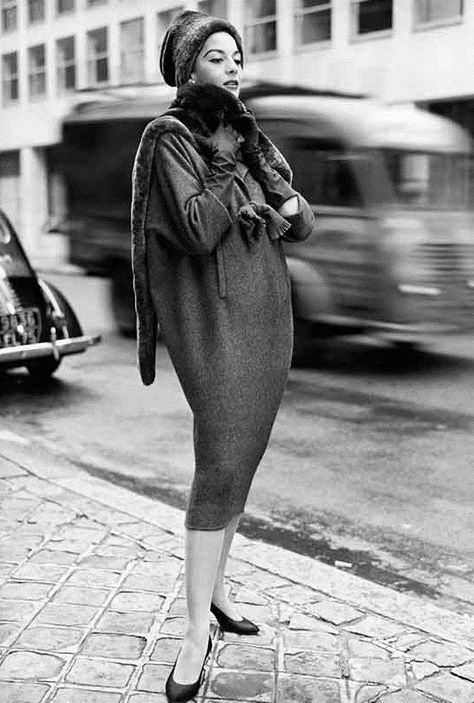 Because this is Balenciaga' "sack dress" of the 1950ies. Here is more of that "sack dress" look. To me this is the ultimate Parisian chic and sophistication. I am a big fan of this look. Last edited by erasure; 04-01-2019 at 11:38 AM..
Pics in the link would have been helpful. Not sure why they rambled on about the style but provided no pictures of what they were talking about. I was born in 1958, so I was probably wearing sacks. hehehe. I am one who prefers dresses that don't have defined waists but that's because I'm tall and the "waist" that fits the rest of you comes up three+ inches too high on me. I was thrilled to find a waistless dress for my niece's wedding a couple of years ago. The YouTube song was funny, though. You can't see pics in my links? Yeah, I remember my mom and sisters wearing 'Shifts" around then. I remember them being really popular for a while. In the early ‘60s and on, into the decade, chemise dresses, and later trapeze dresses, were popular. I certainly wore them. As I recall we wore these with low heel shoes, possibly with bows across the fronts. 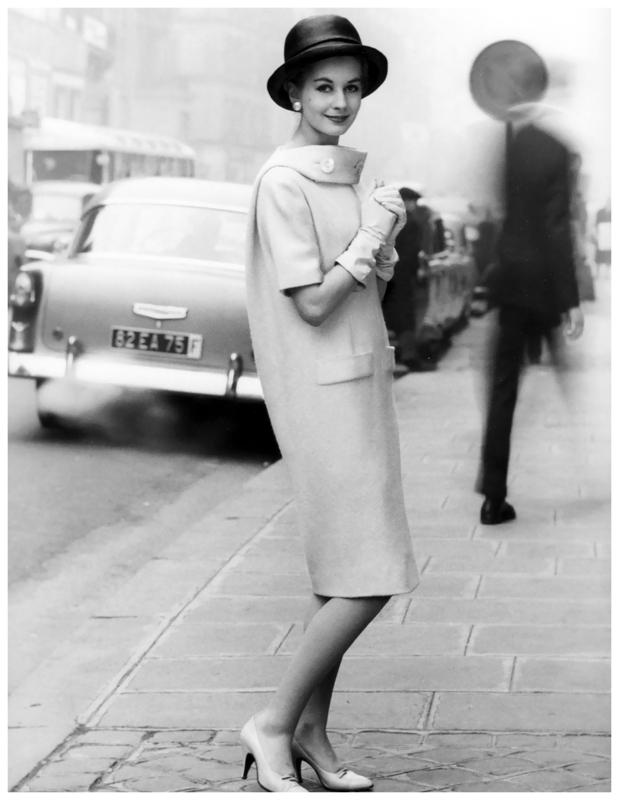 Fashion at that time was influenced by British designers such as Mary Quant. It all sort of flows together in my memory, but I think we wore looser dresses for several years, although there were permutations as years progressed. By the end of the decade everything was influenced by hippie style. By the early ‘70s, women began wearing pants everywhere, and that caused all sorts of consternation. Oh, how could I forget the mini skirt? They were around for quite awhile. Another source of consternation. Our dresses and skirts were short! I remember the consternation regarding women wearing pants. I had to fight for the "right" to wear pants at my place of work. At first, I was only "allowed" to wear pants under my skirt on very cold days and was to remove the pants after I got to work. Then I began to "forget" to wear a skirt over my pants and had to wear the pants all day. Eventually they gave it up and stopped complaining about me wearing pants. I eventually got the personnel manager to officially okay pants for women. The crap women had to put up with in those days. I do remember the sack dress, and then the shift dress. I rather liked them. What goes around comes around. I had dresses with a similar silhouette in the eighties. They change the emphasis from the waist to the hips, legs. and derriere. My favorite club dress was nearly identical to the red dress I linked to, and I got a very positive male response when I wore it.